February is American Heart Month, so I’m going to put my dietitian hat on for a second and talk to you about heart disease. Heart disease is the number one killer of both men and women in the United States. Number one! That mean we need to be paying attention to our hearts, people! Luckily, many of the risk factors for heart disease are modifiable. You can reduce your risk for heart disease by not smoking, including exercise in your routine, not drinking excessively, and by eating a heart-healthy diet. The American Heart Association recommends consuming at least two servings of fish (with an emphasis on fatty fish like salmon) every week to reduce the risk of a heart attack or stroke. Fatty fish like Alaska salmon is high in omega-3 fatty acids, which research has shown can improve heart health. Another bonus? 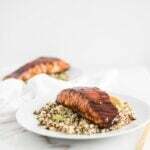 Alaska salmon goes well with so many different flavors and is easy to prepare quickly! 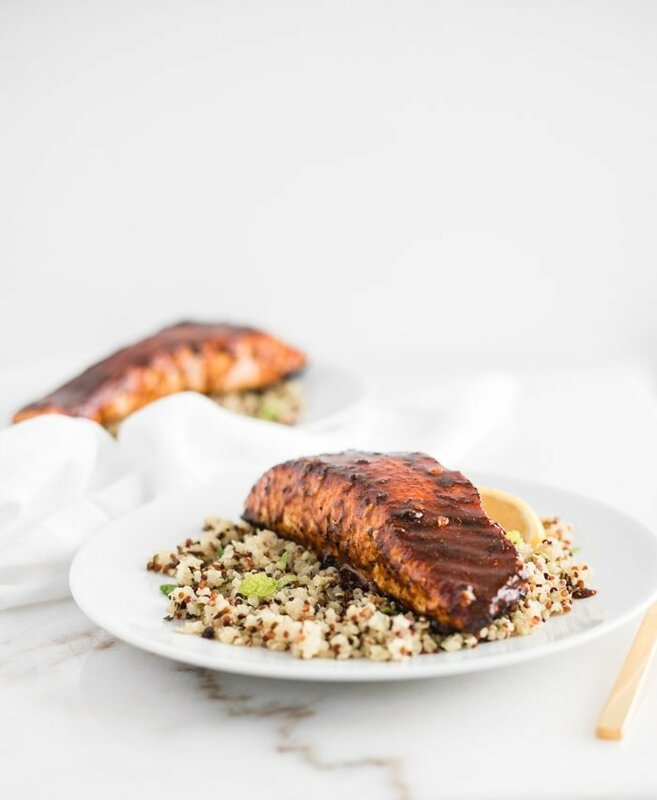 I put together this super easy recipe for harissa glazed Alaska salmon with a quick three-ingredient harissa glaze that is just as delicious as it is simple. 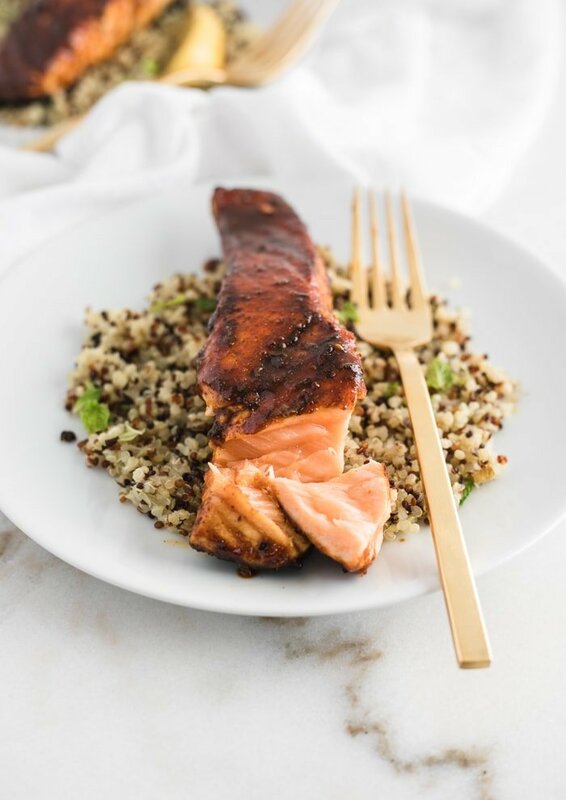 In this delicious dinner, a harissa glaze gives the salmon a spicy-sweet flavor that is a great contrast to the bright, fresh flavors in the lemon mint quinoa. It’s a flavorful way to change up your dinner routine, and it’s loaded with nutrients – protein, fiber, heart-healthy omega-3s, and B-vitamins. The combination of protein, fiber, and fat make this meal both filling and satisfying. 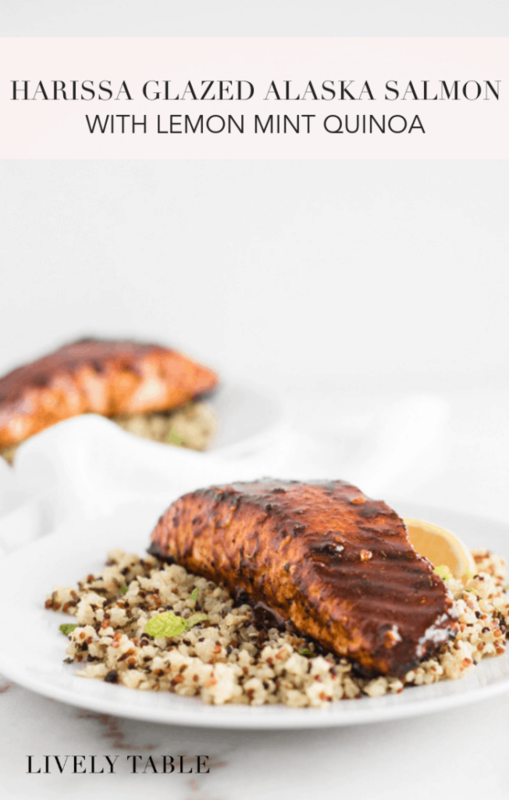 This harissa glazed Alaska salmon recipe is perfect for healthy weeknight meals. 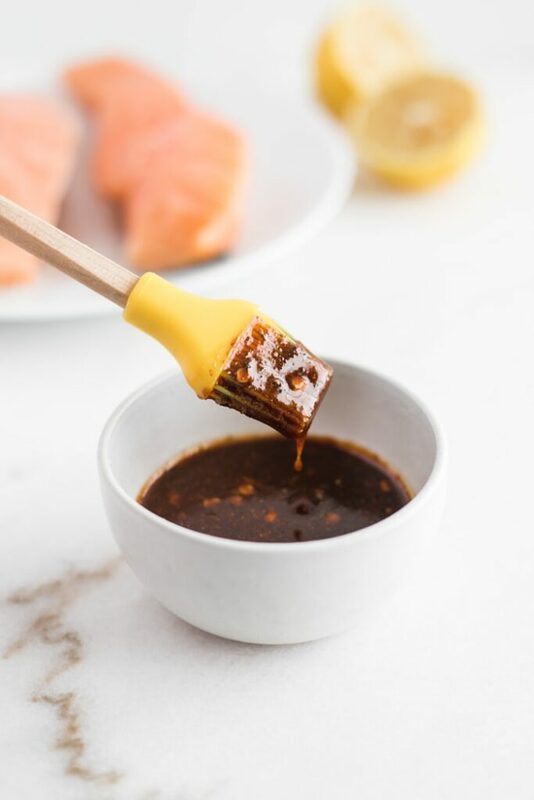 It’s as simple as searing the salmon in a nonstick skillet, then brushing with the harissa glaze. 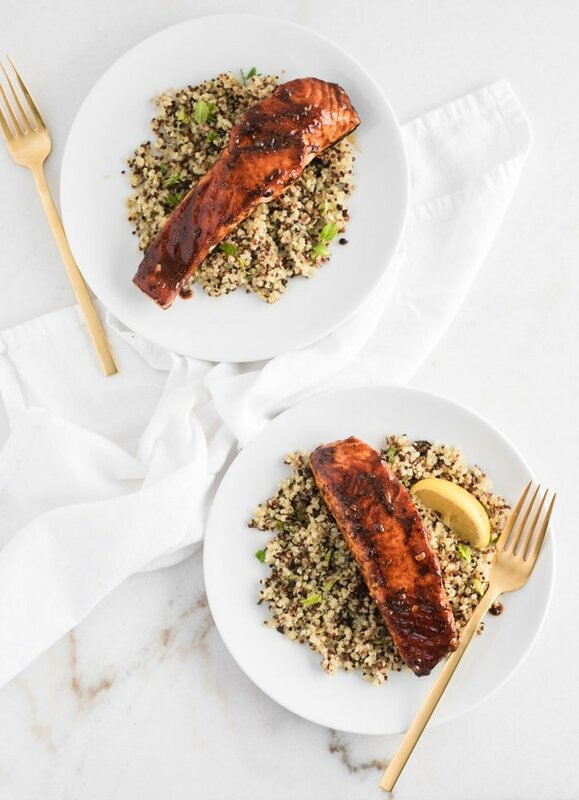 You can make the glaze and cook the salmon while the quinoa cooks. Add a green salad or your favorite veggie, and dinner is served! A delicious, easy to prepare meal that is so much more than just your standard fish for dinner – what could be better for getting you to that two servings of fish per week (and a healthier heart)? 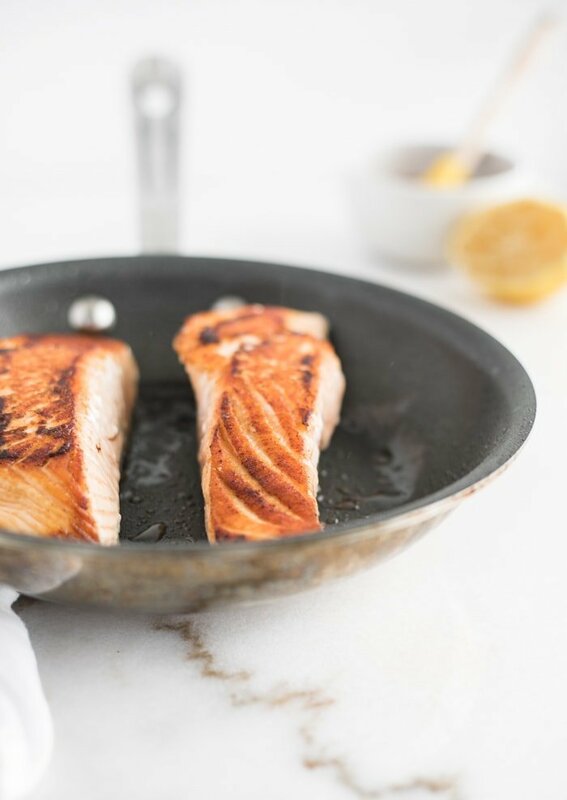 As always, be sure to ask for salmon from Alaska at the seafood counter, or look for ‘Alaska salmon’ in the freezer aisle to ensure high quality, sustainable, wild caught seafood every time! Confession time – I bought a jar of harissa simply because I saw it multiple times on the show Beat Bobby Flay, thank you so much for letting me know what to actually use it for! Ha! Yes, this is a great use!